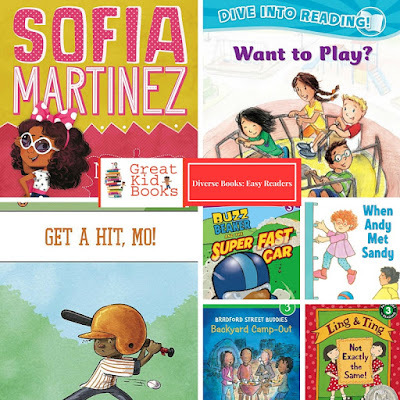 Easy Readers help children take their first independent steps in the world of reading. They allow children to take charge of their reading, to enter the world of a story and build meaning from both the words and the pictures. These books typically are small in size, use simple vocabulary and large font sizes. Bradford Street Buddies: Backyard Camp-Out, by Jerdine Nolen -- Similar to the classic Henry & Mudge stories, this series features an African American family living in a multicultural suburban neighborhood. Buzz Beaker and the Super Fast Car, by Cari Meister -- uzz Beaker, an African American boy who is always making new quirky things, invents a super-fast car to help get everywhere on time, but it will only go fast. Super fun? Or a recipe for disaster? Get a Hit, Mo! by David Adler -- African American Mo Jackson may be the youngest and smallest player on his baseball team, but he overcomes the odds in this satisfying story that will have readers cheering him on at every step. Ling and Ting: Not Exactly the Same! by Grace Lin -- Ling and Ting, Chinese American sisters who are identical twins, may look the same but they like different things, react to situations differently and want everyone to remember that they are not exactly the same. A delightful series full of humor and heart. Sofia Martinez: My Family Adventures, by Jacqueline Jules -- Sofia’s happy, loving Latino family brings smiles, and many readers will relate to her stories. Bright illustrations and short chapters create lots of kid appeal. Want to Play? (Confetti Kids) by Paula Yoo -- Pablo, Lily and their friends play together at the local park, having fun on the swings, playing basketball and going on the play structures. A diverse cast of characters and short, easy sentences make this a terrific choice for new readers. When Andy Met Sandy, by Tomie dePaola -- A sweet story that shows a friendship developing slowly, tentatively between two children who meet at a local playground: dark-skinned Andy and red-headed Sandy. Expressive but simple illustrations and short, easy sentences make this very accessible for new readers. Many thanks to the publishers for sharing review copies: HMH, Capstone, Penguin, Candlewick, Lee & Low and Simon & Schuster. If you make a purchase using the Amazon links on this site, a small portion goes to Great Kid Books. Thank you for your support. What a great list of books! Would you be interested in linking up this post to the Diverse Children's Books Link-up? You can find it at http://pagesandmargins.wordpress.com/2016/06/18/diverse-childrens-books-link-up-june-18-july-1/. Thanks! Thanks for sharing this list! My granddaughter and I have more to read!